Specialists in building bespoke boat interiors, each uniquely tailored to suit the owner’s own personal taste. Our work ranges from complete new build to renovations of older boats, repairs. 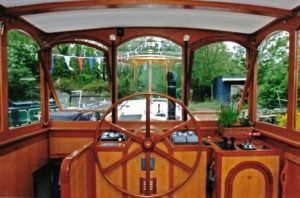 We also build marine-grade joinery doors, wooden hatches, windows, teak wheelhouses, and much more, all designed to complement the style of your particular vessel. 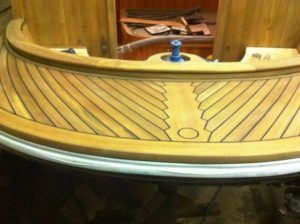 We are dedicated craftsmen with a passion for boats and an eye for excellent joinery Read on to find out more. Chiselpig offer a complete fit out service for both new build and older Dutch Barges (along with other types of boats), to extremely high specifications. See examples of previous Dutch Barges we have fitted here. fitting and maintaining launches is a speciality and we particularly enjoy applying this level of detail and craftmanship to customers more traditional boats. 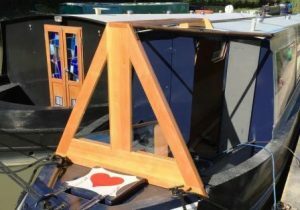 With the increasing popularity of larger boats on the regions waterways, we have worked on numerous Wide Beams in recent years and consider ourselves something of experts in creating some of the finest boat interiors. The sole trader of this small business has been building boats and fine boat interiors for over 26 years for private individuals and company flagships. Having built many Dutch barges, Launches, Widebeams and Narrowboats, we have a vast knowledge of styles and the intricate workings of these crafts. The combination of your ideas and our real world experience will deliver a fully functional yet extremely attractive end result. We typically work for clients along the Kennet & Avon Canal, River Thames and London, either in your Marina, by the towpath or from our own spacious workshop which can accomodate two large boats. This enables us to undertake large or small projects all year round. Our work ranges from complete new build to renovations of second hand boats and repairs. We also build marine-grade joinery doors, wooden hatches, windows, teak wheelhouses, and much more, all designed to enhance the style of your particular vessel. from complete fit outs, to upgrades and repairs, we can offer you the tailored boat you thought you could only dream of.